Click here to view the Informatuion download for SAM4s SPS-340 cash register in Acrobat Reader (308 kb). Right click on the link to save the brochure onto your hard drive. The SAM4s SPS-340 is a powerful cash register designed to work for food service establishments. With a large flat keyboard allowing you to sell menu items with just one touch. Not to mention look up windows that are available on these cash register that allows eight menu items on one button. One of the big reasons the SAM4s SPS-340 is a great cash register is the 8 line LCD display. With this display the SPS-340 is easier to use for your cashiers and the owner operator. Why is it easier to use? Because rather than traditional cash register programming the SAM4s SPS-340 is menu driven. Yes that's right, you want to change a price or add an item then turn the key to program and follow the prompts. It really is nearly that easy to use and program. You will be amazed at what you can program on this register without ever opening the manual. If you have been looking at cash registers you may notice this cash register is almost the same as the SPS-320 right? Well it is the exact same machine with one huge difference, the SAM4s SPS-340 has a dual tape printer instead on of only one like the model SPS-320. So now if you prefer to have a cash register with a receipt and journal you can do that. If you are OK using an electronic journal then the SPS-320 may serve you better. Fans the of SAM4s ER-650 will be happy to know that the SPS-340 really is the same machine with an added printer and SD card port. Sure it may look very different from the ER-650 but if you know how to use the 650 and like the way it works you will be right at home with the SPS-340 cash register. 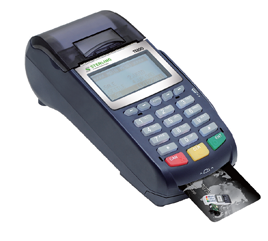 The Smart ECR Credit card terminal from Sterling Payment Technologies connect directly to your cash register. Accept EMV Chipped cards, Swiped Cards and debit cards directly from your cash register. For more information about the EMV Credit Card terminal for the SAM4s SPS-340 cash register and of course you can call us at 1-800-863-2274 for additional information.